You may still be able to book by calling the hotel at 408-745-6000. Despite its location in a rather nondescript but busy area of Sunnyvale, the Sheraton Sunnyvale has plenty of surprises up its sleeves. For starters, the hotel offers a somewhat serene setting, with well-kept grounds of blooming flowers and vibrant greenery. Then there's the Olympic-sized pool, with plenty of lounge chairs. And finally, the rooms are spacious and well-appointed, with the Sheraton's signature Sweet Sleeper beds, large work desks with ergonomic chairs, LCD TVs and coffee makers. A lively lounge and restaurant round out the offerings at the Sheraton Sunnyvale, which is full of pleasant surprises. Sheraton Sunnyvale Hotel is a 3.5-star hotel located at 1100 N Mathilda Ave, Sunnyvale, CA 94089, US . Its nightly price usually falls between $99 per night and $979 per night, excluding tax, depending on room category. At Sheraton Sunnyvale Hotel, AAA members often get 7-13% off the regular rate. For example, on January 18, 2019, a AAA rate of $120.32 per night was offered. Depending on your itinerary, your savings can be more than the annual AAA membership fee itself! Many Room 77 users are able to pay for their entire AAA membership in a single stay. 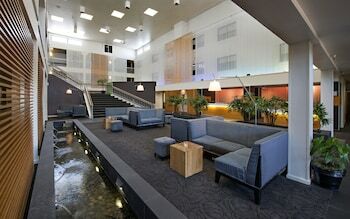 At Sheraton Sunnyvale Hotel, seniors often get 6.4-10% off the regular rate. For example, on January 18, 2019, a senior rate of $92.65 per night was offered - a 6.4% discount from the next-lowest rate. For January 18, 2019, a special AAA rate of $120.32 per night was found for the AAA Promotion, AAA Membership Card Required, - Deposit Required, Guest Room, 1 King room type. 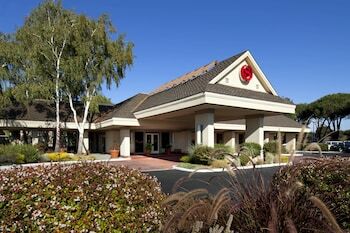 For December 25, 2018, a special Senior rate of $92.65 per night was found for the Marriott Senior Discount, 62 Years and Older - Valid ID Required, Guest Room, 1 King room type. Sheraton Sunnyvale Hotel sells rooms through sites like Room 77, Expedia, Hotels.com, GetARoom, and many others. Room 77 searches across dozens of different sites to find the lowest discount rates available. The lowest rate we've seen over the last few weeks was found on Room 77. In 1% of the cases we surveyed, all sites offered the same rate. You can compare real-time rates from all of these sites on Room 77. Room 77 is the only hotel shopping site that includes special discounts like AAA, senior, government, military, and corporate rates.